Yellow, cloudy and dull headlights all have something in common – they provide low visibility at night. Besides making your headlights look old and dingy, headlights with oxidation cut down on the brightness of the lights and actually block some of the light emitting from the headlights. Oxidation buildup occurs on plastic headlights from the sun and weather over time. You don’t have to spend hundreds of dollars on replacing your headlights. 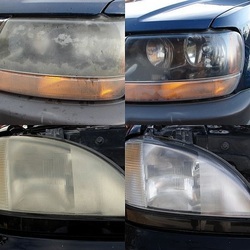 AW Collision's expert technicians can quickly and efficiently remove oxidation from plastic headlights.